1. Look at job listings for design positions while you’re in school. Yes, this is normally something you’d consider once you’re finished with school, or almost finished. It actually makes much more sense to look at what’s in demand while you are still in school. Knowing what positions are in demand will likely influence your course selection, and perhaps even alter your focus. 2. Talking to senior level designers while you’re in school will also help in your course selection. For example, if you’re interested in working in book design, you may talk to a creative director at Penguin Books who informs you that typography is something they look for even more so than packaging. Well, perhaps taking Advanced Typography is more important than a Package Design class (even if you reaaaallly want to take that Package Design class). However, if you speak to someone at a Package Design Agency, they may stress the importance of including several packaging samples in your portfolio, which you can do easily if you take a Package Design class. 3. When given design resources begin to organize them immediately. One year out from graduation, I became overwhelmed by the exponential increase in designers I was meeting, following their blogs not to mention looking at portfolios and software tutorials. It became a monumental task to organize the abundant amount of resources in such a way that I could actually find them useful as helpful resources. Once you’re working in a job, there isn’t time to search through a dozen stock photography websites, but knowing which ones are your favorites and most useful is good to know before you begin working. Delicious.com is a great way to organize them. But keeping a spreadsheet or an updated Bookmarks/Favorites document is good to be able to transfer them between browsers and computers. Spending a few minutes after each class organizing what websites are most helpful will become a huge timesaver once you’re working full-time as a designer. 4. Create (and access!) your own resources. At times I waste hours at work searching for a perfect photo or a certain Photoshop brush. You can easily make your own resources…take photos everywhere you go, turn cool letters into a font or make a pattern into a brush. Then, through cloud computing, and such websites like dropbox.com, you can keep your own stock photos, brushes, fonts, etc. in a folder that you can access from a work computer, home computer or smart phone. 5. Develop relationships with your instructors from the beginning. 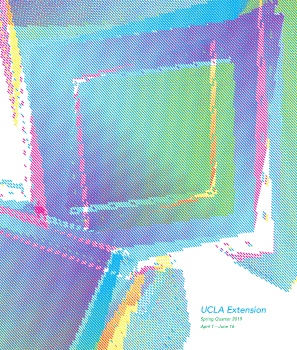 Your instructors are one of the most useful resources UCLA Extension offers. Get to class early and stay late. Every instructor is a working designer with contacts, connections and an employer. Heck, your instructor may even have his/her own design employees! Connect with them onFacebook, LinkedIn and Twitter. Every instructor has a wealth of knowledge and experience that you can tap into. Of course, always treat them with respect, and understand they’re just as busy as everyone else! 7. Attend every AIGA event you can. As a student, I felt like I didn’t belong there. It’s not true! AIGA (American Institute of Graphic Arts) is an incredible resource to learn about jobs, internships, lectures, events and contests. Even if your membership expires, consider volunteering — just a few hours a week will give you the opportunity to meet other designers and make useful connections that can lead to an internship, freelance work or even a job. 8. Try to take classes in the order suggested by the DCA program. There is a reason the classes are meant to flow in a particular order. Your efforts in school will make more sense because skills build upon each other and you’ll utilize tools from previous classes in subsequent classes. 9. Connect with Karen Lauritsen. Continuing Education has different nuances than undergraduate or graduate programs. Karen understands the issues that students coming from different careers are facing. She can provide helpful advice that’s not found on UCLA’s website or the catalog or any design book. – Thanks, Sherene! You can reach me through this blog or at dca@uclaextension.edu or 310-206-1422. 10. Read this blog and join the Facebook group. Reading this blog (which you’re obviously doing right now!) is helpful to learn about internships, new classes, design lectures and student events. And joining the Facebook group will help you feel like you’re part of a community to connect with peers who are maybe a few years ahead of you or a year behind you. Starting a new career can be very challenging, but having a place to connect with people in your same situation can help the transition. By Sherene Strausberg, UCLA DCA Certificate 2010. Sherene is currently working as a Multimedia Graphic Designer for Katz Marketing Solutions in New York City. She can be reached at sherene@sweetnotes.com.